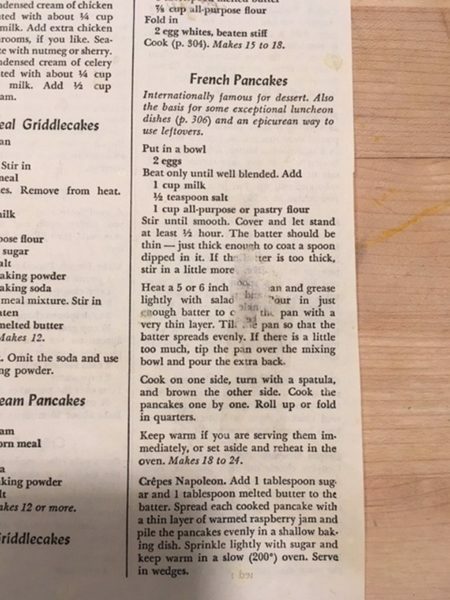 Crêpes are simple enough to make. My previous attempts have been pretty disastrous—maybe it was just thinking they were easy and overreaching. Anyway, they made it onto my things to challenge myself to cook list. Luckily, I’ve got a couple of friends who are crêpe making fans/fiends and one of them recently gave me a private tutorial. 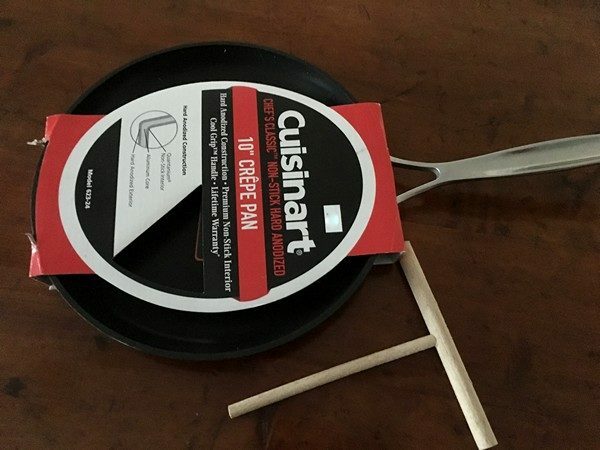 I brought my own pan so that any miraculous achievements could be reproduced at home and a spreader stick that I’d brought back from France (more about that later). We mixed up her go-to batter and let it rest overnight (not necessary but resting for 30 minutes is a good idea). The next morning, we got to work. Jan has a special ladle she uses for crêpes that I’m guessing is about ¼ cup. We heated up the pans, smeared them with butter, and Jan poured a ladle full of batter into her pan, expertly swirled it around, let it sit for a minute, flipped it et voilà , a perfect one, first time out. My first attempt wasn’t too bad, but there was a spot in my pan that lacked proper batter coverage. However, flipping it was simple and I ended up with an acceptable (i.e. edible) crêpe. A few more later, and I was getting the hang of it, but was still not getting full coverage in my pan, so I decided to try bringing out the French spreader stick. Bad idea. 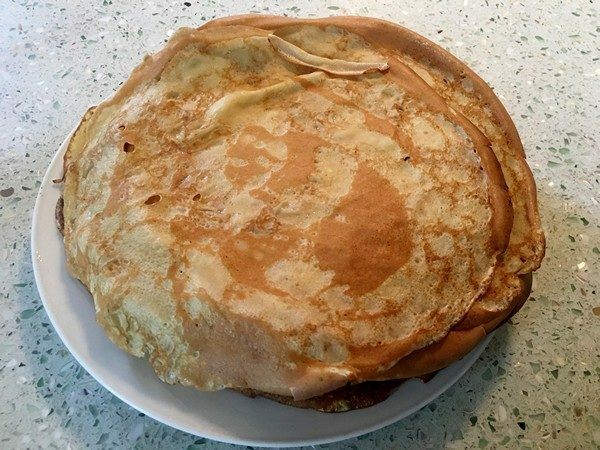 Of all the crêpes we made that day (and we made a nice stack), it was the only one that was a failure. So, I’m going to blame my previous failures on lack of proper equipment. Beat the eggs until well blended. Add the milk, salt and flour and stir until smooth. Cover and let stand for at least 30 minutes (we refrigerated overnight, and let come to room temperature before making). I had some filled with Italian ham and a slice of Swiss cheese and a couple for dessert with a drizzle of my friend Kristin’s amazing Cara-Sel, salted caramel sauce. Both ways were great! What’s your favorite crêpe filling? I’m going to try them like that, sounds delicious! Butter makes everything better! Thank you again for my tutorial! 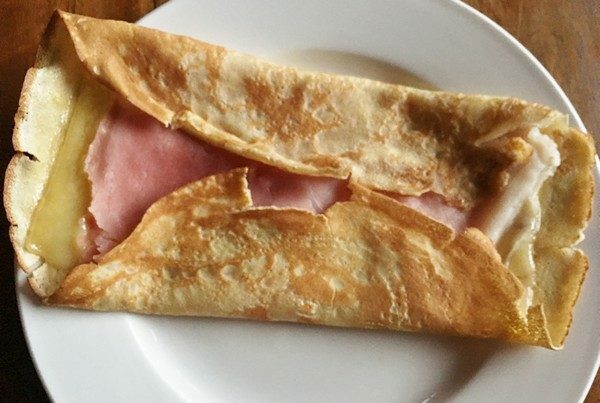 I love these crepes, although in England I grew up calling them pancakes. My mother made them every Easter and we sprinkled them with sugar and lots of lemon juice; absolutely delicious. Your ham and cheese crepes look scrumptious; I have to try those!